Your time is one of your most valuable resources. There are so many demands on your time that it can be a real challenge to get everything done for your classes, go to work (if you have a job), and still have some time left for having fun, relaxing, spending time with family, having a social life, and so on. Learning to wisely manage your time now will be a benefit to you for your entire life. 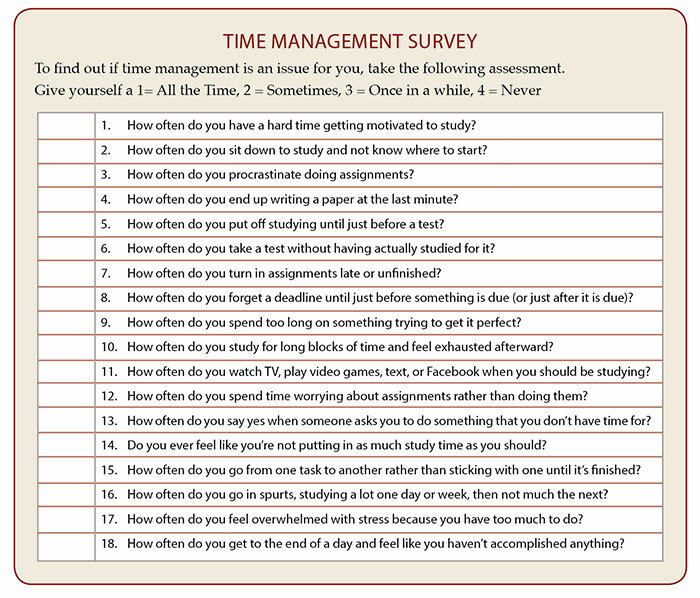 Take the Time Management Survey below to find out how you are doing so far at managing your time. The first step in effective time management is to decide what things are most important to you. You have only so much time and only so much mental and emotional energy. Knowing what is most important to you is the first step in making the most of the time you have. What are the big items on your list? SCHOOL Doing well in school should be one of them — getting an education requires commitment, and should be something that you are willing to devote a good chunk of your time and energy to. WORK If you have a job, you will also have to spend time meeting your obligations there. FAMILY/FRIENDS You may have a spouse or family who needs your time and attention, or you may have friends whom you want to spend time with. TAKING CARE OF YOURSELF You also need some time for sleeping, eating, shopping, doing dishes, preparing food, doing laundry, etc. FREE TIME Hopefully, you will have some time left for leisure activities like reading, playing sports, enjoying hobbies, texting friends, participating in college activities, etc. What about having a job? Many students work. The good news is that studies have found that students who work 12-20 hours are often better students than those who don’t have jobs. However, grades drop off quickly when students work more than 20 hours. If your circumstances require you to work more than this, you should not plan to be a full time student. Students who try to work full time and go to school full time are rarely successful. You can still finish a degree while going to school part time. Having a plan will help you spend your time on the things that matter to you rather than on whatever is in front of you at the moment. Student life is divided into semesters. It can be very useful to have a calendar in which you can see all the important dates in one place — such as the one at the beginning of this book. Fill this out if you haven’t already done so. Detailed planning is usually done by weeks. There are many kinds of planners that you can use; experiment with different kinds to see what works best for you. There are online planners (for example, Google calendar) as well as notebooks that you can carry around (like Franklin planners). If you aren’t already using one of these, try out the Weekly Planner here. First, write down all of your classes in the first column. Then use your semester calendar to figure out what items you need to work on this week for each class. You should include assignments, reading, studying for exams, reviewing notes, and working on larger projects, like gathering research for a paper. Figure out what you need to do each day, and write it in. In the space below this chart, you can add other things that you need to do, as well as things you’ve been meaning to do but haven’t gotten around to. On the next page, mark the times that you are in class, at work, or other commitments you have made. After you have those filled out, look back at the things you need to do each day. Figure out what would be a good time to do them. Do you have an hour between classes when you could get an assignment done? Do you have some time in the evening to meet with a study group to get ready for an exam? How soon after each class can you review your notes? Add up the time you are spending on each class — does it add up to two hours a week for each hour in class? Don’t put things off until right before they are due. By looking ahead, you can get things done early, at a good time for you, instead of in a rush at the last minute, and still have time for other things that matter to you. As you go through the week, try to follow the plan that you made. Of course it won’t be perfect — some things may take more or less time than you planned and unexpected tasks or opportunities may turn up, but make an effort to stick to it. Remember that by following your plan, you are taking care of the things that are most important to you rather than giving in to your desires from moment to moment. 4. Learn from what happened. After the week is over, review how your plan went. Try to learn from both good and bad experiences. Is the morning not a good time for you to do math assignments? Do you need to plan more time for your English class? Do you need to get to bed earlier? 5. Make a new plan each week. You should have a regular planning time each week to look back over the previous week and make a plan for the new one. This could be Sunday night, Monday morning, etc. Experiment with this kind of planning until you find a system that works for you. 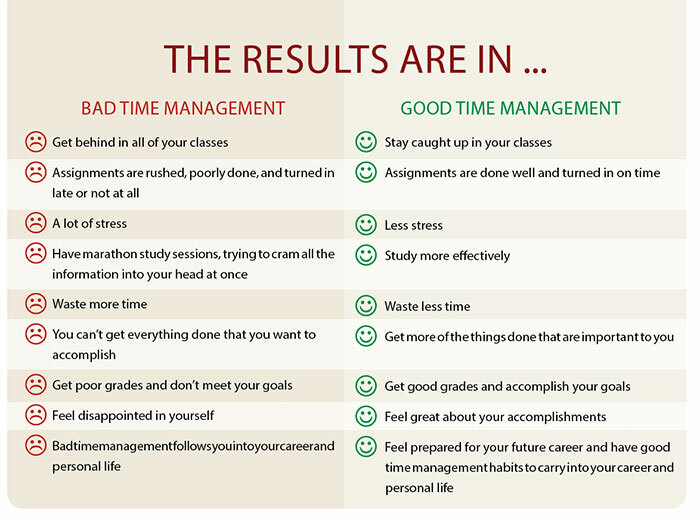 you are succeeding at time management! Even the best planners can run into road blocks that result from human nature. Most of us admit to procrastinating from time to time, having trouble getting started, etc. Here are a few suggestions to consider. 10 minute rule: When you can’t seem to get yourself going, try the 10 minute rule. Say to yourself, “I will make myself work on this for 10 minutes. Then if I can’t stand it, I’ll stop.” Many times, if you get going on something for 10 minutes, you’ll build up some momentum and have the energy to keep going. If not, then this really isn’t a good time for this activity. If you have planned ahead and aren’t doing it at the last minute, then you can make a choice to stop and try again another time. Easiest thing first: Look at your list of things to do and find the easiest one to finish. This will let you cross something off your list and help you feel like you’re getting somewhere. Hardest thing first: If there is something that you are really dreading doing, do it first. Sometimes tackling the hardest thing on the list is helpful because it will take a huge load off of your mind just to get that thing out of the way or at least started. What’s your purpose? If you find yourself procrastinating a lot, go back to your goals. Why are you doing this? What’s in it for you? Are you going to fall short of your goals because you couldn’t get on the ball or are you willing to invest your time and energy now to create a better life for yourself, your children, and your grandchildren? Work smarter: Consider whether you can find a way to make studying more enjoyable. Rather than just looking through your notes, try studying with a classmate, listening to a recording of class while you are exercising, or making a big concept map on a white board with colored markers. Consider studying in the Tutoring Center, where you can get help right away if you have a question. Get organized: You can lose a lot of time looking for things if you don’t have some way to organize papers for your classes. Get a different folder or notebook for each class and keep the syllabus, your notes, and any papers the professor gives you in order. Small bites: Make sure not to plan huge blocks of time for one class. Your brain only works well at something for about 20 minutes; after that, you need a break. If you try to study for three hours straight, only the first 20 minutes of it will actually be productive. Studying for 30 minutes each day for a week is much better than three hours the night before an exam. First step: If you usually don’t procrastinate but find there is one thing you keep putting off, it may be because you’re skipping the first step. Ask yourself: what is the very first thing I need to do? Maybe you need a graphing calculator to do your math homework and you don’t have one or money to buy one. You thought maybe your roommate had one but don’t remember. Every time you think about starting your math homework, you put it off because you don’t have the calculator. Then what should be on your list is not “do math homework” but rather “text roommate about calculator.” Make the thing that is keeping you from getting started your focus, rather than the task itself. Once that’s done, then you can move forward.